May the road to your roots rise up to meet you — just follow these seven steps for tracing Irish ancestors. The late English author Pete McCarthy, who was Irish on his mother’s side, decided to travel the length of Ireland in search of his roots. His method of research? Stop in every pub called McCarthy’s and talk with the people there. While this is certainly one way of finding your pot of genealogical gold at the end of the rainbow, there are other paths to take, albeit probably involving a bit less craic. Certainly, a trip to Ireland should be in your future — if for no other reason than to say you’ve been to every pub sharing your surname. But you don’t have to venture across the Atlantic before waving your shillelagh and shouting, “Erin go bragh!” Our seven-step guide will get your Irish roots search going right here at home. 1. Learn a wee bit of history. You probably realize that exploring the history of your ancestral homeland helps you understand why your ancestors left it and where they settled. Between 1851 and 1921, 4.5 million people departed Ireland, with 3.8 million coming to the United States. According to the 2000 census, 30.5 million US residents claim Irish ancestry — more than seven times the 4.2 million living in the Republic of Ireland today. The island of Ireland’s population peaked around 8 million before the Potato Famine, perhaps the most famous emigration impetus, which lasted from 1845 to about 1849. All of Ireland merged with the United Kingdom in 1801; a 1921 treaty partitioned the island into the independent Irish Free State (now the Republic of Ireland) and the six counties (Antrim, Armagh, Londonderry, Down, Fermanagh and Tyrone) of UK-governed Northern Ireland. Disputes over the treaty led to civil war until 1923. A 1998 agreement ended “the Troubles,” a period of civil unrest between nationalists (primarily Catholic) and unionists (primarily Protestant) in Northern Ireland. For more history, see the overview at <www.dochara.com/stuff/history.php> and The Course of Irish History, 4th edition, by T.W. Moody and F.X. Martin (Roberts Rinehart Publishers). 2. Know what you’re up against. As much as you’d like to find relatives’ passenger lists, however, those prior to about 1891 probably won’t specify where your ancestor came from, other than “Ireland.” Remember, too, many Irish first went to Canada and then traveled to the United States. The best you may be able to get is a narrow span of years when your forebear came to this country. But that’s OK. I’ve never found the passenger-arrival list for my Great-grandma Delia Gordon, but I’ve stood in front of the house in County Leitrim where she was born. I’ll take that over a passenger list any day! • Knowing it’s your ancestor: Gathering enough identifying information is important to researching your ancestor in US and Irish records. I might as well have been searching for John Smith in New York when I tried to figure out who John Donovan’s Irish-born parents were. By 1885, he’d received a land patent in North Dakota and settled his family there. His wife’s name was Maria. Census records said his place of birth was either Illinois or Iowa. Wanna guess how many John Donovans appear in the 1880 census index for Iowa and Illinois? By piecing together information from a variety of records in the United States, I aimed to assure myself I’d found the right couple and learn the identity of John’s parents. Fortunately, John used a middle initial, W., which helped narrow my search. There was a John W. Donovan in 1880 in Waukon, Allamakee County, Iowa, with a wife Maria, both the right ages to be the couple I sought. Living with them was John’s brother “Neily,” a nickname for Cornelius. I found a civil marriage record that gave Maria’s maiden name but no other helpful clues except the minister’s name, Father David Slattery. I researched him to learn what parish John and Maria were married in. Then from the church records, I added another relative: Margaret Donovan, a baptism sponsor for John and Maria’s first child. I’d also researched John and Maria’s North Dakota children, and by obtaining the children’s death certificates and obituaries, I was able to confirm I had the right Iowa couple. I braved Iowa’s 1870 census indexes, looking for a John, a Cornelius or Neil, and a Margaret or Maggie of the right ages in one household. In a printed 1870 census index, I found several households with children of these names. But only one fit the age configuration: the household of Martin Holverson and his wife, Catherine, included the three children, plus six more. Going on the assumption the Donovan father had died by 1870 and his wife remarried, I checked for a probate in Allamakee County. There I found one for Daniel Donovan, naming his wife Catherine and nine minor children including John, Cornelius and Margaret. The estate wasn’t settled until all Daniel’s children had come of age in 1887, 22 years after he died. John was recorded in the probate as John W. Donovan, with wife Maria, then residing in North Dakota. I’d found the immigrant ancestors, so I could next focus on searching for where in Ireland they came from. 3. Understand Ireland’s geographic divisions. To find records in Ireland, you’ll need to learn not only your ancestors’ Irish county, but also the townland — which isn’t a town. Townlands are the smallest administrative division in Ireland, similar to our neighborhoods. Be aware of several other geographic divisions, too: Your ancestor’s “address” may be something like the townland of Knockavinnane, Poor Law Union of Tralee, Parish of Ballymacelligott, Barony of Trughanacmy, County Kerry, Province of Munster. Don’t worry if this sounds like a bad tongue twister. 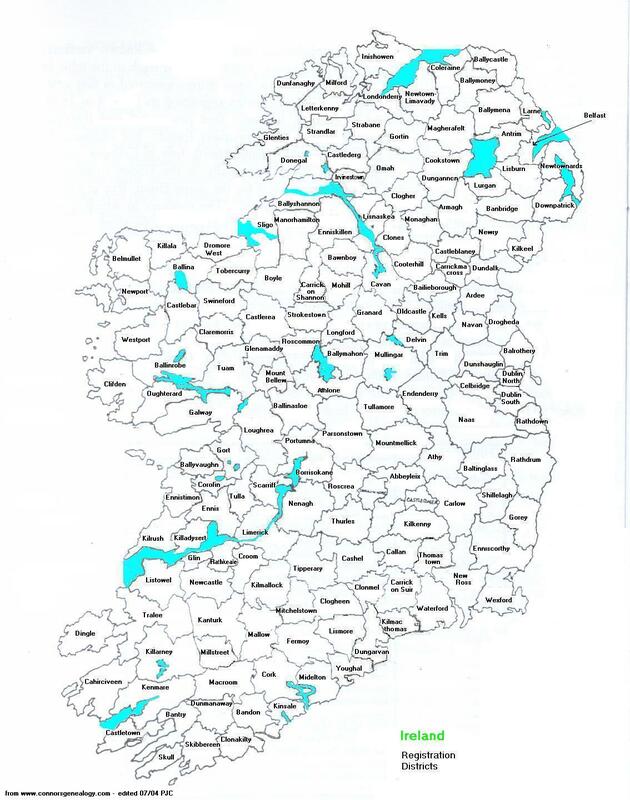 To sort out these geographical divisions, start with the Administrative Divisions of Ireland explanation <rootsweb.com/-fianna/guide/land-div.html> and the General Alphabetical Index to the Townlands and Towns, Parishes and Baronies of Ireland (Genealogical Publishing Co.). At <www.seanruad.com>, you can search on a townland and get the name of its province, Poor Law Union, county, parish and barony. Your next challenge is identifying that specific place of origin on the Emerald Isle. Although the island of Ireland is about the size of Indiana, it can seem as big as Jupiter if that’s all you have to go on. Of course, learn all you can about your Irish ancestor in American records, and with a bit of Irish luck, you might discover her origins. Leave no Blarney Stone unturned in your search, including tombstones. The Irish are known for including the county and sometimes the townland of origin on their headstones — for example, Bridget McNamara’s Richmond, Va., headstone says she was a native of Kildysart, County Clare, Ireland. Be sure to look for obituaries, death certificates and church records in America, as Catholic priests with largely Irish congregations might have included this information in records of marriages, baptisms or burials (see the February 2004 Family Tree Magazine for church records how-tos). But a place of origin can turn up in any record, so gather every document your ancestor might’ve created in America. Expanding your search to all family members’ records is key, too, as I learned when researching my great-grandmother Delia Gordon. She and her twin sister, Mary, emigrated from Ireland. Some relatives thought they were from County Cork. Records for Delia, Mary and their immediate families said only “Ireland.” When Mary attempted suicide in 1906, a newspaper article mentioned another sister, Annie, whom I hadn’t known about. I started tracking Annie’s family, and her husband’s naturalization gave Annie’s origins as County Leitrim. Because of my lengthy search far the three sisters, I could give the County Leitrim Heritage Centre (part of the Irish Family History Foundation’s network of genealogy centers) enough information to find the Gordons in church records. Turns out they lived in the townland of Ardvarney. To find Irish Heritage Centres and learn what records they have, go to <www.irish-roots.net/counties.asp>. They’re genetally not open to the public, and they charge a fee for searches, but some offer recods and indexes on their Web sites. If you’re still coming up empty on the place of origin, broaden your search to people associated with your ancestor, such as witnesses to baptisms, deeds, and other records, as well as Irish-born neighbors listed in the census. Immigrantes tended to migrate with and settle near people they knew from their homeland. Still not finding the place in Ireland? After you’ve exhausted all the records the Irish immigrant, her family and associates might have created, start researching the lines forward. Use censuses, vital records, city directories, online phone directories and message boards to research the children and grandchildren of the immigrant generation. Information on family origins might have been passed down in another branch as oral history or a document that’s now in the hands of a second cousin. A word of caution, though: Family stories may claim your ancestor came from County Cork (as they did for my great-grandmother), Dublin or Londonderry. While it’s certainly possible, these were also sites of major ports of departure. It’s possible your immigrant left from one of these places, but was born and raised elsewhere. If these areas come up, activate your genealogy radar and dig deeper. 6. Explore Irish record resources. The bounty includes census, lands probate, military, vital (both civil and church) and other records — more Irish research material in one place than just about anywhere else. The FHL also has maps and more than 3,500 reference book, directories and periodicals covering Irish history, genealogy and geography. To learn more about the FHL’s microfilmed records and get additional tips for tracing Irish roots, print the library’s free Ireland Research Outline. From the FamilySearch home page, click the Search tab, then Research Helps, then click on the I and scroll down to Ireland. You’ll also see a county map of Ireland, a historical timeline, and a register of the library’s city and rural Ireland maps. David Ouimette’s Finding your Irish Ancestors (Ancestry) includes a handy listing of the FHL’s Irish genealogy resources. See the next step for more on important Irish genealogical records and how to find them. The sheer numbers of Americans claiming Irish ancestry translates into plentiful online resources. Start sorting them out at Cyndi’s List <cyndislist.com/ireland.htm>. GENUKI <www.genuki.org.uk/big/irl>, a free site for UK and Ireland research, is a must-visit destination. Select your ancestral caunties or “all of Ireland” for how-tos, historical information, surname list, recommended refarences and links to sites with genealogical records. Visit the Ireland GenWeb Project <www.irelandgenweb.com> and the Northern Ireland GenWeb Project <rootsweb.com/~nirwgw> for mailing lists and record abstracts. (Volunteers oversee each county site, so content varies.) As for subscription-based Web sites, Irish Origins’ <www.irishosrigins.com> records include Griffith’s Valuation, a will index and the 1851 Dublin city census. You can purchase three days of access for $10 or a month for $19. 7. Get your hands on the records. Following is an overview of the records where you’ll start your Irish ancestral research. Keep in mind that while some Web sites link search results to record images, much of what you’ll find online is abstracted information from the actual record. Look for source details and always seek the original record whenever possible. Unfortunately, few of those census records are left. The 1922 Four Courts fire in Dublin, sparked by Irish patriots, ruined all but fragments of returns from 1821 through 1851. The government destroyed those from 1861 to 1891 after compiling population statistics. So the only ones you can use are the 1901 and 1911 censuses. The schedules give each person’s name, relationship to the head of the household, religion, literacy, occupation, age, marital status, county of birth and ability to speak English or Irish. The National Archives of Ireland has made 1911 census records for Dublin free online <www.census.nationalarchives.ie>; the rest of that census and the 1901 count will follow. Until then, since there’s no microfilm index, you’ll need to find the FHL film with your ancestors’ county and district electoral division (DED). Find the DED in Townlands in 1901-1911 Censuses of Ireland, Listed by District Electoral Divisions, on FHL microfilm rolls 1544947 through 1544954. Then run a place search of the FHL catalog on the county and civil parish and look for a 1901 or 1911 census heading. Click on each title, then on View Film Notes to find the roll for the right DED. You may be able to locate online indexes or abstracts for some areas. Check the county listings at the Ireland and Northern Ireland GenWeb sites, and see Census Online <www.census-online.com/links/lreland> and Census Finder <www.censusfinder.com/ireland.htm>. An early 20th-century records office employee indexed Dublin’s 1851 census before the 1922 fire; the information on 60,000 heads of household is on Irish Origins and on a $50 CD from Eneclann <eneclann.ie> (click Shop). • Church records: Look for baptisms or christenings, marriages, burials and meeting minutes. Though today’s Irish citizens practice many religions, pre-20th century Irish were predominantly Catholic, Protestant (Church of Ireland, the state church), Presbyterian, Methodist and Quaker (Society of Friends). Each denomination had its own systems for keeping and retaining records. The FHL has microfilmed a third of all Catholic parish registers, some transcriptions of Church of Ireland and Presbyterian parish registers, and a good number of Quaker parish registers. Run a place search of the online catalog on your ancestors’ county, then look for a church records heading. Visit the GenWeb sites for your counties of interest, too — they may have abstracted church records. An 1876 law required Church of Ireland parishes to send their registers to the Public Record Office in Dublin. This law was amended in 1878 to let parishes with sufficient storage keep their records, so not all parish records went to Dublin. Further, some ministers copied records before sending on the originals. That means you still can find many Church of Ireland records despite the 1922 fire. If the FHL doesn’t have your ancestors’ church records, you can find out where to request them by consulting the 11-volume Manuscript Sources for the History of Irish Civilization by Richard J. Hayes. Look in the subject indexes under Parish Registers and Vestry Books for Church of Ireland records; look by denomination for other churches’ records. In the place indexes, look for church records by county and then town, city or parish. The National Library of Ireland also has many parish registers; see its guide at <www.nli.ie/en/parish-register.aspx>. • Civil registration: Ireland’s civil birth, marriage and death records begin in 1864. (Before then, you’ll need to look for vital statistics in church records.) Civil registration records are organized into districts. The originals stayed with district registrars, with copies forwarded to the General Register Office in Dublin <www.groireland.ie> (staff there can respond to record requests, but can’t do research for you). Records for Northern Ireland were moved to the General Register Office or its district offices <www.groni.gov.uk>. The FHL has many of the birth, marriage, and death indexes and registers for Ireland and Northern Ireland on microfilm. In the online catalog, click Place search and type in ireland. Look for the Civil Registration Indexes and Civil Registrations headings. Before 1878, the indexes are arranged by year and alphabetically by surname; after that, they’re alphabetical by quarter year. The place name you’ll find recorded in the index to civil registrations is the district where the event was registered. So, for example, the index might show, “Gordon, Mary. Manorhamilton. vol. 10 page 501.” Manorhamilton is the registration district, but not necessarily the place where Mary was born. You would need to look at the record to learn the townland where this Mary Gordon was born. And to determine what county that registration district is in, go to <www.connorsgenealogy.com/districts.htm>. You can see a map of the districts at <www.connorsgenealogy.com/RegistrarDistrictsMap.jpg>. • Griffith’s Primary Valuation and Ordnance Survey Maps: Between 1848 and 1864, every civil parish in Ireland made a valuation of taxable property. These Griffith’s Primary Valuation records name the head of household and the landowner, and tell the property acreage, value of the property, and the tax assessed — making them a good substitute for the lost 19th-century population censuses. The lists are organized by county, barony (a subdivision of a county), civil parish and townland. Additionally, each townland has a map number so you can locate the property on Ordnance Survey maps — detailed maps created beginning in the 1830s. Using these resources, you may be able to identify the exact location of your ancestors’ land and even their still-standing cottage. You’ll find Griffith’s valuations and survey maps online (except for counties now in Northern Ireland) at Irish Origins. There, you can search records from 1847 to 1864 on a person’s name or a place and narrow results by townland or other administrative division. Irish Origins is the only place online to get all the valuations, including images of the original records. The free Griffith’s Valuation 1848-1864 <www.failteromhat.com/griffiths.php> offers nationwide coverage without record images. You can also find Griffith’s Valuation databases for various counties on the GenWeb sites and elsewhere online — try a Google search on the Irish county name and griffith’s valuation. Griffith’s is on FHL microfilm, too — run a keyword search on Griffith’s valuation and the county. Ordnance Survey maps (1837 to 1913) also are available through fee-based sites such as Ireland’s Historical Mapping Archive <www.irishhistoricmaps.ie/historic> and PastHomes <www.pasthomes.com>.The FHL has maps from 1834 to 1845 on microfiche. In the library catalog, run a place search on ireland and click the Maps heading, then scroll down to the Irish Townland Survey link. • Tithe applotments: Predating Griffith’s Valuation are Tithe Applotment Books, kept from 1823 to 1838. Everyone, regardless of religion, was supposed to pay a tithe to support Church of Ireland clergy. Tithes record the head of the household’s name and the property value. In 1831, ancestors who defaulted on their tithes were recorded on another list — see FHL microfiche 6394360 through 6394367 to find out which counties have these records on film. Like Griffith’s valuations, you’ll find tithe applotments online at commercial and volunteer Web sites, as well as in books and FHL microfilm. If you’re lucky enough to research in Ireland, consider adding these repositories to your itinerary: In the Republic of Ireland, go to Dublin and visit the National Archives and National Library (see opposite page for contact information), Genealogical Office <www.ireland.com/ancestor/browse/records/genealogical/irish.htm>, General Register Office, Land Valuation Office <www.valoff.ie/research.htm> and Registry of Deeds <www.landregistry.ie>. In Northern Ireland, stop by the Public Record Office of Northern Ireland (see opposite), Presbyterian Historical Society <www.presbyterianireland.org/phsi> and General Register Office. Yes, it can be a rocky road to Dublin and a long way to Tipperary or anywhere else in Ireland. But with patience and persistence, you could soon be on your own pub tour, toasting your genealogical success. From the March 2008 Family Tree Magazine. This entry was posted in Irish Genealogy and tagged blessings, irish. Bookmark the permalink.